Subwoofer Crossover circuit is designed to use an audio installation that is used for the addition of a subwoofer. Often, additional loudspeaker is located on an audio space that are a little more far-reaching. If the lower frequency response is quite far, all is well and good, but the filter circuit or crossover is needed to cut the high frequency of, say, 150 Hz. Often, a circuit subwoofer is an active filter, but here it will require additional power supply. 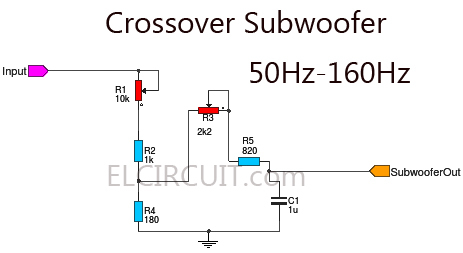 This circuit is a series of one passive crossovers, which are designed so that the speaker signal of the existing system can be used as the input signal. Because the bass information present in both (stereo) loudspeakers, signal to a sub woofer can be tapped from one of them. circuit is a 1st order low-pass filter with a variable input (P1) and presettable cut-off frequency (P2). The signal from the loudspeaker is applied to terminal 'LSP'. Voltage divider R1-R2-R4 is designed for use with the output signal of an amplifier average output of around d 50 W. Frequency crossover circuit can vary between 50 Hz and 160 Hz with P2. The values ​​of R3, R5, and C1, calculated on the assumption that the subwoofer amplifier to connect to K1 has a standard input resistance of 47 kΩ. If this number is lower, the value of C1 needs to be slightly increased. It is advisable to open a full subwoofer amplifier volume and adjust the sound level P1. This ensures that the input of the amplifier subwoofer can not be overloaded or damaged. Make sure that the soil of the signal lines associated with the base loudspeaker amplifier subwoofer. If the phase reversal is required, this is best done by reversing the cable to the subwoofer. If in spite of the additional protection above the desired at the input of the amplifier subwoofer, is most influenced by the 'overload protection' elsewhere on this site.